An ideas application will help employees and administrators create, find and categorize the best ideas within a company. Employees can rank ideas through voting, and ideas can be created separately or can be promoted from existing conversations on Yammer. Yammer is also going to be upgrading content sharing by allowing users to preview information in shared links. The startup has also added a Q&A app that encourages workers to ask questions and find answers from a database, and includes a polling application. Additionally, the new version of Yammer will allow users to assign a task resulting from conversations and track its completion, and will include the ability to tag content with topics, making it easier to find conversations by subject. Another integral part of Yammer’s transformation into an open social platform is the ability to install third-party applications. Yammer will soon give third-party developers the ability to sell and create applications like those that Yammer will now offer. It’s similar in theory to the Google Apps marketplace. In terms of communications functionality, Yammer is adding the ability to send Direct Messages to multiple parties, and a chat feature, which will allow users to create chat rooms that can be archived or searchable. Missed chats will automatically become direct messages. A new Activity Feed will aggregate stories about co-worker actions within all of their enterprise apps (both on and off Yammer) and will allow users to follow content. And a new notification feed will alert users in real time about co-worker actions that affect them. 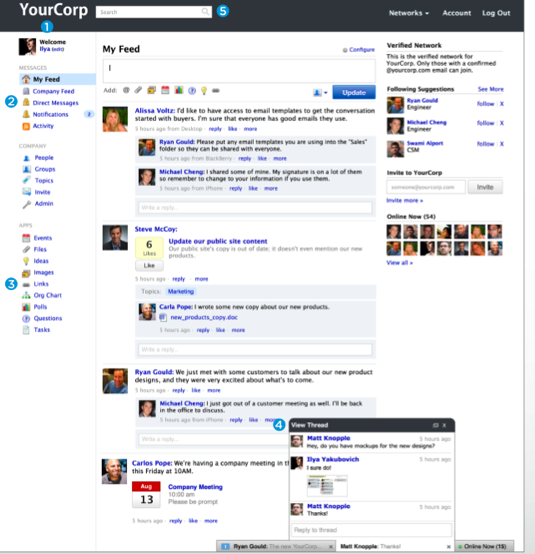 Yammer CEO and founder David Sacks tells me the feed is one of the key components of social networking and existing enterprise platforms have been built before the concept of a realtime feed. 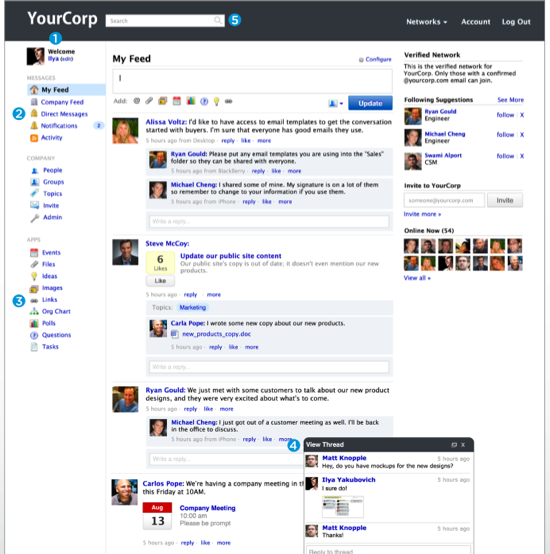 Yammer’s next-generation application, he says, will help enterprises create a social communications platform around data and communications. In terms of the big picture view of the social enterprise, Sacks believes that the ability to create a go-to corporate social network is a Facebook sized opportunity. Half of the social web entails sites like Facebook and Twitter, explains Sacks, and the other half will be around enterprise social networking. And he makes it very clear that Yammer hopes to be the de-facto application for companies, both big and small, to use for their social networking efforts. Of course, it’s safe to assume that either an existing social enterprise player, such as Salesforce, or even Google may want to purchase Yammer to boost their own offerings. Sacks says he’s received considerable interest in his company, but for now he wants to focus in creating the best product in the space. That, he says, is going to be the new version of Yammer.